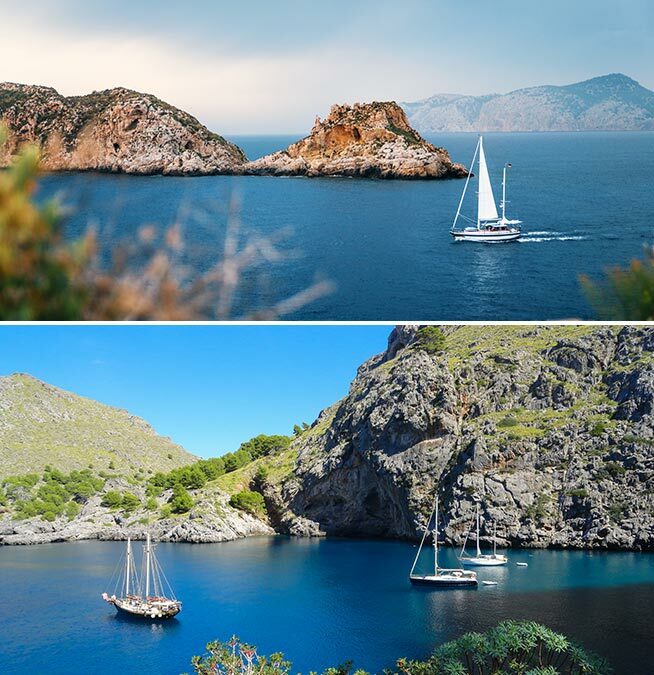 Mallorca sailing holidays are a dream come true! Navigare Yachting is your gateway to a Balearic Islands holiday getaway. There's a reason this Spanish Mediterranean destination is so beloved: stunningly clear turquoise waters, immaculate white sand beaches, underwater adventures and sea life, and entertainment into the early hours of the morning. Spain is a magnificent Mediterranean sailing destination that offers you a chance to explore an adventure destination famous for its flamenco music, fiestas, delicious cuisine, remarkable architecture, vibrant nightlife, dramatic history, and much more. Sailing the Balearic Islands includes the Spanish coast, where you can explore vibrant seaside towns, gorgeous hidden coves, appealing white sand beaches, and charming fishing villages with a local history that stretches back centuries. 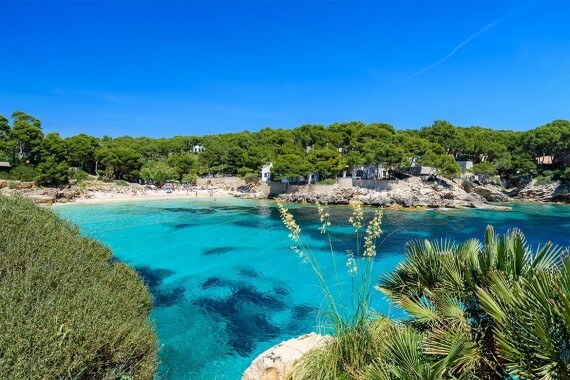 This area is ideal for island hopping: the Balearic Islands of Mallorca, Ibiza, and Menorca are among the most diverse and gorgeous archipelagos in the world. Mallorca, where our yacht rental Mallorca base is located, is dotted with white sandy beaches and surrounded by crystal clear blue water that is warm, clean, and thriving with abundant sea life. These islands enjoy the most relaxing and indulgent vibe you can imagine! 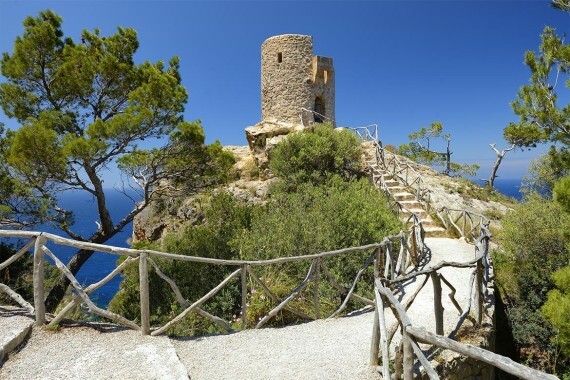 Discover the endless opportunities for fun & sun at Mallorca, the capital of the islands. 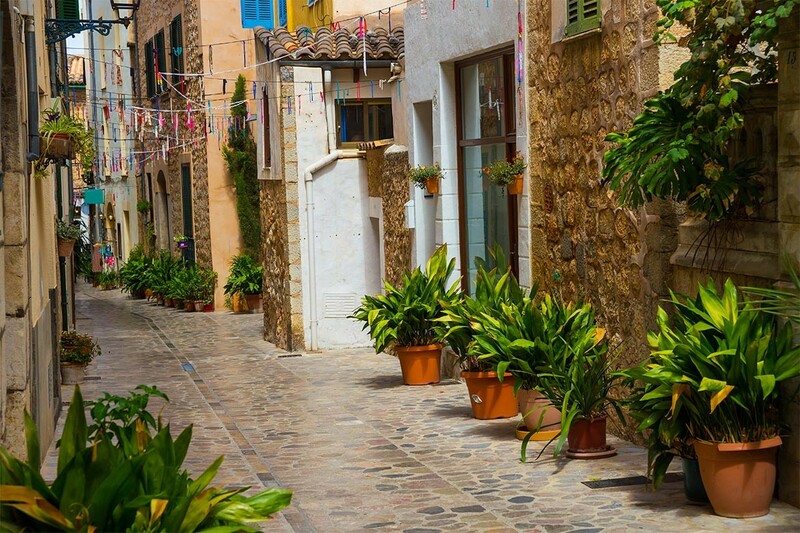 Beaches, snorkeling, dining, entertainment – Mallorca has it all! Experience Ibiza, one of the premier party destinations in the world. There's glamour & luxury in every corner of this iconic holiday getaway location. 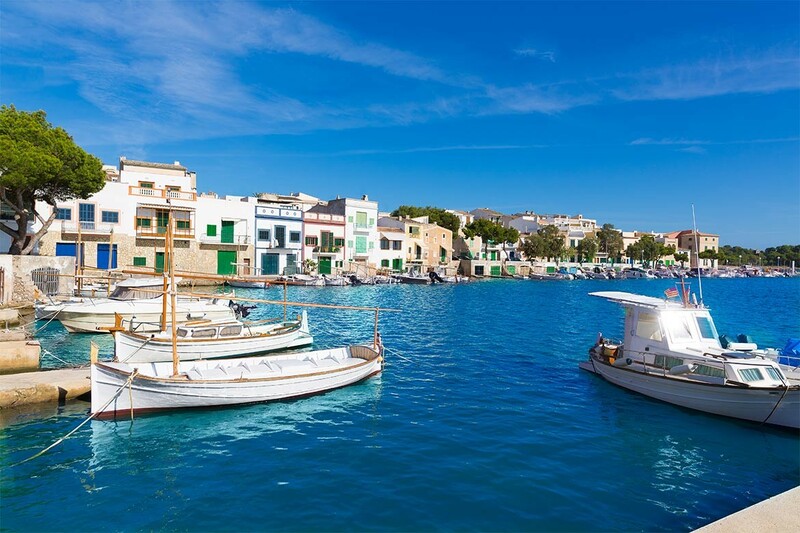 Slow down and enjoy the peace & tranquility of Menorca, with quaint fishing villages, secluded rocky coves, and beautiful sights off the beaten path. Sailing around Mallorca and the islands is fun and relaxing, with warm weather, favorable winds, and beautiful ports of call studded with amusement options. Whether you're planning an extended holiday or just a brief vacation getaway, we make sailing Balearic Islands an epic destination. Choose from a selection of the area's best sailing boats and crewed yachts, or bareboats for the more experienced sailor. Planning is just as easy, thanks to our exclusive extended payment plan – pay for your sailing charter Mallorca vacation in up to six monthly installments. It's the best vacation destination and the best deal! Book online to save time and get the best rates – browse our Balearic Islands fleet of charter boats and choose the option that's best suited to your vacation plans. When not sailing or swimming, sample delicious meals from local restaurants, which offer exquisite seafood dishes, tapas classics, and cuisine influenced by all the cultures of the Mediterranean. Charter duration for a yacht rental Mallorca, sailboat rental Mallorca, or bareboat charter Mallorca is seven days. Take a closer look at our sailboat and bareboat fleet to learn more, we have a wide range of excellent vessels, including skippered options. 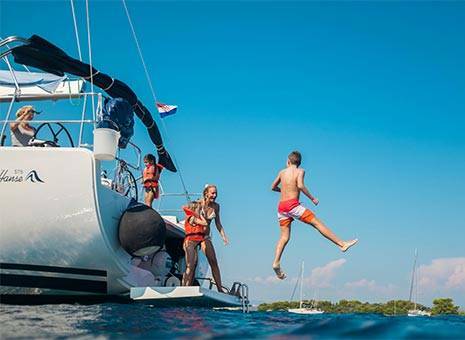 Sailing around Mallorca is an ideal holiday for families, groups, and couples. Navigare Yachting is a trusted Mallorca sailing holiday provider, we are ready to send you on the vacation of a lifetime! Mallorca is the largest island and offers a little something for everyone. It has warm white sand beaches for relaxation, snorkeling and scuba adventures beneath the sea, hiking & biking in the island's rugged interior, and wonderful small towns and fishing villages to explore. Everything in Mallorca is within easy reach. Beach resorts, restaurants, and entertainment in Palma, the capital, are world-class attractions. 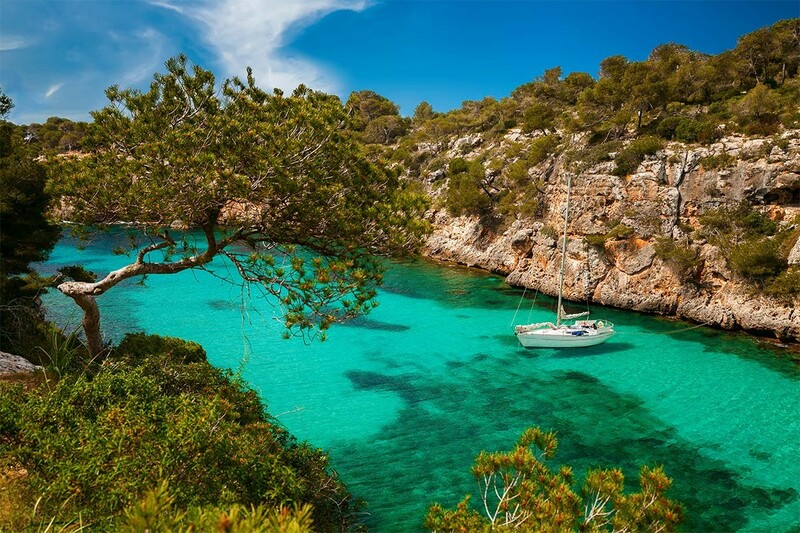 Your sailing Balearic Islands vacation begins here. Ibiza is the famed party destination of the Balearic Islands. Celebrities and the fabulously wealthy gather on the island, where discotheques, bars, and nightclubs offer entertainment into the wee hours of the morning (and beyond). You're never more than a few steps away from ultimate luxury and indulgence on Ibiza. It's party reputation makes it one of the world's most glamorous and indulgent vacation destinations. Menorca is the more laid back of the three islands, dotted with picture-postcard fishing villages and sun-splashed white sand beaches, and hosts a rugged coastline with dramatic cliffs and cozy, hidden coves. It's tranquil and secluded, with boutique hotels and small restaurants and markets that somehow avoid being overrun by tourists. The beaches of the beautiful southwest coast – Cala Macarella, Son Saura, and Cala en Turqueta – are among the most gorgeous and beloved beaches in the world. The island also offers vineyard tours, outdoor sports, and fine dining options. Ready to turn your Mallorca dream into a reality? Check our sailboat offer, Navigare Yachting is here to help you make beautiful Mediterranean scenes and luxurious entertainments a part of your vacation experience. Booking with us is easy and convenient. We offer a booking payment plan that allows up to six monthly installments – that makes planning your Balearic Islands vacation simpler and more fun. Review our fleet page to get an idea of the bareboat or skippered charters available and choose the option that's perfect for you! The Mediterranean climate of the Balearic Islands creates ideal sailing conditions during the popular summer season. Summers locally are hot & dry, with bright sunlight; spring and fall are cooler with more precipitation and developing winds. “Embat” is the name of a local thermal wind that blows during summer. It's a wonderfully warm and predictable breeze that typically begins around noon and gains strength during the day, then tapers off as the sun goes down. It makes exploring the Balearic Islands a joy for all sailors. Menorca experiences the roughest conditions in general, as it absorbs the full force of buffeting northerly winds. 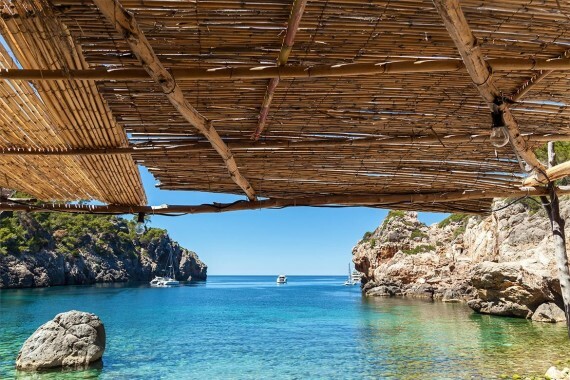 Mallorca and Ibiza have milder and more forgiving conditions, on average. Temperatures from June through September range from an average of 28°C during the day and down to 21°C at night. Rain typically occurs on fewer than 10 days total for June-September. Early season (March-May) temperatures are only a little bit cooler, an average of 20°C during the day and down to 13°C at night, with only slightly more rain than during summer. Late season (October-November) temperatures are still very mild, an average of 25°C during the day and down to 18°C at night, with moderate precipitation. LOCAL CUISINE: Seafood features heavily in Balearic Islands cuisine, particularly dishes that feature fresh local catches, like lobster, grouper, and squid. The islands' lobster stew is famous in the region: it's a tasty and indulgent blend of savory flavors, offered in almost every seaside restaurant. 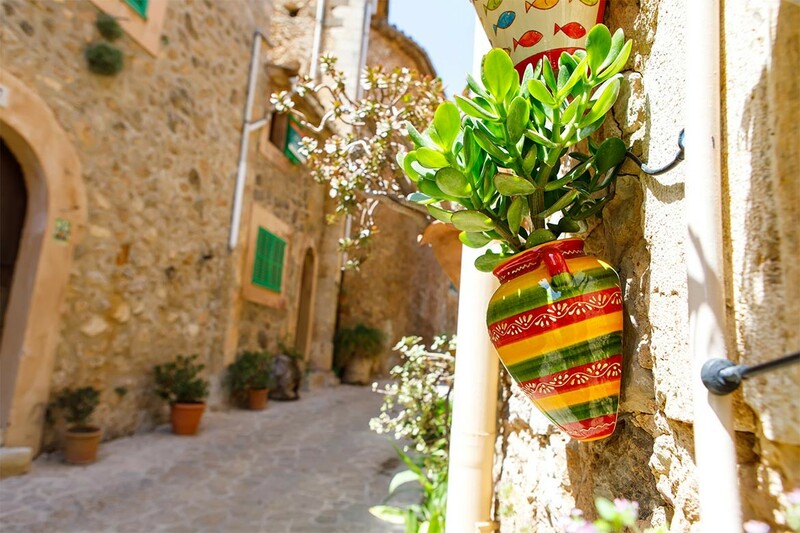 Catalan cuisine favorites, including tapas menus, are also popular on and around the islands. Nearby menu influences from Italy, France, Algeria, and Morocco are also common. 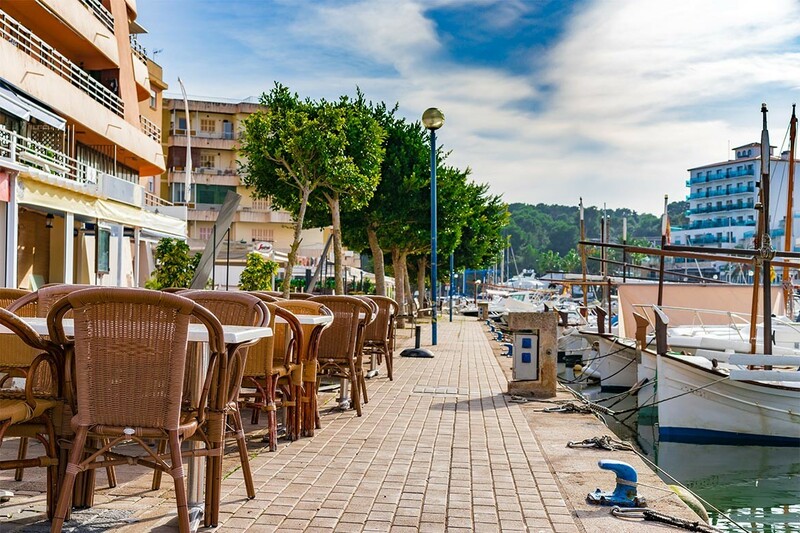 Balearic Islands restaurants cater to an energetic and fun-loving crowd, expect a wide range of choices in menu, style, and dining atmosphere. 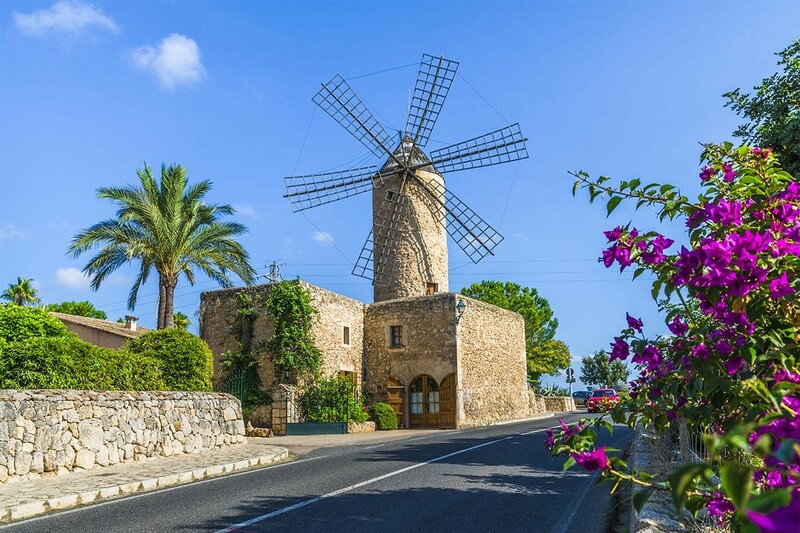 Whether you're looking for a quaint little beach side cafe or a Michelin-starred fine dining experience, sailing around Mallorca and the Balearic Islands is your gateway to delicious food and spectacular entertainment. It's easy to get to Mallorca to enjoy your bareboat charter Mallorca or sailing charter Mallorca holiday. 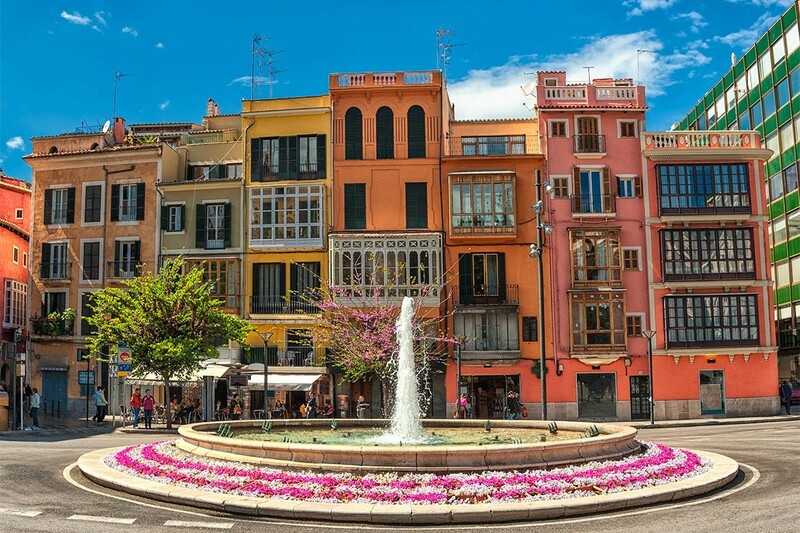 Palma de Mallorca International Airport is served by all major regional and international carriers, with regular flights from nearby metropolitan areas in Spain, France, and Italy, as well as direct flights from London, Amsterdam, Berlin, and other major European cities. Once you've landed, the Navigare Yachting headquarters at Marina Alboran is only 15 minutes away by car or taxi (paid parking is located adjacent to the marina). We're centrally located to a full range of conveniences, including banks and several markets for provisioning. The marina facilities include toilets and showers, hot and cold drink machine, and an ice dispenser. Marina Alboran is also close to numerous restaurants, bars, discotheques, and clubs, where you can sample the island's luxurious fun & sun entertainment options. 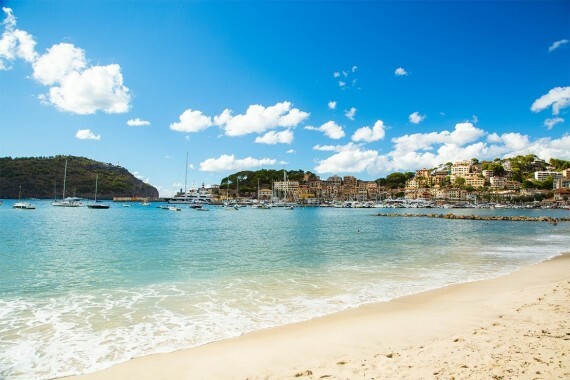 The sunny and warm Balearic Islands await! Book your Mallorca sailing holiday today, Navigare Yachting makes it simple and convenient to get started. We even offer a special payment plan: you can pay for your Mallorca yacht charter in up to six monthly installments, which allows you to plan your vacation easier. Want to get started? Visit our fleet page to take a closer look at our charter sailboats and charter bareboats, including skippered charter options. We're looking forward to showing you why a sailing Balearic Islands holiday is a vacation you will treasure your entire life! Check out more favorable prices for the selected yachts & selected charter periods. Do not miss the chance to rent a yacht from Navigare Yachting this season! Bareboat, skippered or crewed luxury yacht charter - browse our fleet in Spain to find the perfect yacht for your sailing vacation. 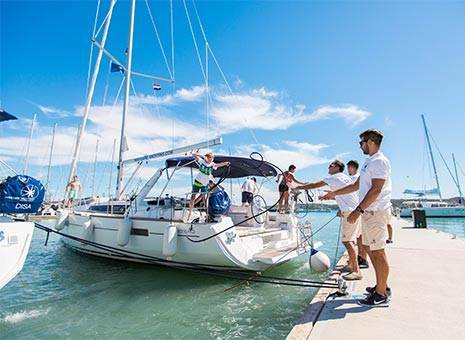 We are here to help you whether you want to learn how to sail and enjoy the freedom of sailing, or you want a guided sailing experience, or you need help to organize your corporate sailing event. Sail away to beautiful Spain in one of our amazing iteneraries. The Balearic Islands are a sailing dream destination: warm weather, pristine turquoise waters, glorious white sand beaches, underwater adventures and sea life, and five-star dining & entertainment options around every corner. Your Mallorca holiday is a chance to live in luxury like few have the opportunity to do in their lifetime! 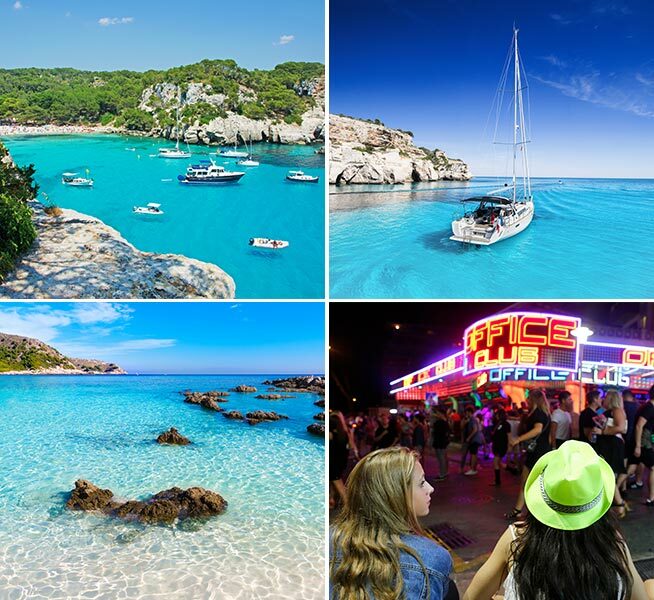 The beautiful Balearic Islands are waiting for you! 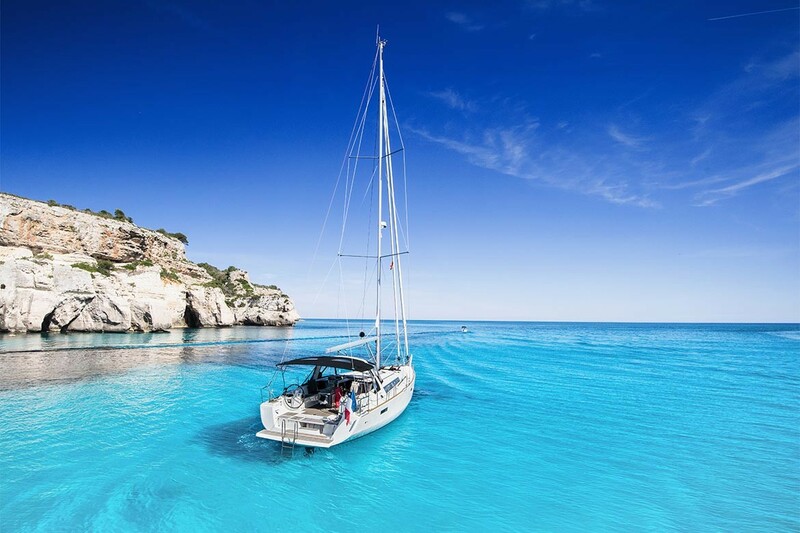 Book your Mallorca sailing holiday today to enjoy the best rates, including our exclusive payment plan: you can pay for your Mallorca yacht charter in up to six monthly installments. It's the easiest and most convenient way to enjoy your Mallorca holiday. Visit our fleet page to take a closer look at our charter sailboats and charter bareboats, including skippered charter options. Navigare Yachting is ready to help you create Mallorca yacht charter memories that will last a lifetime! 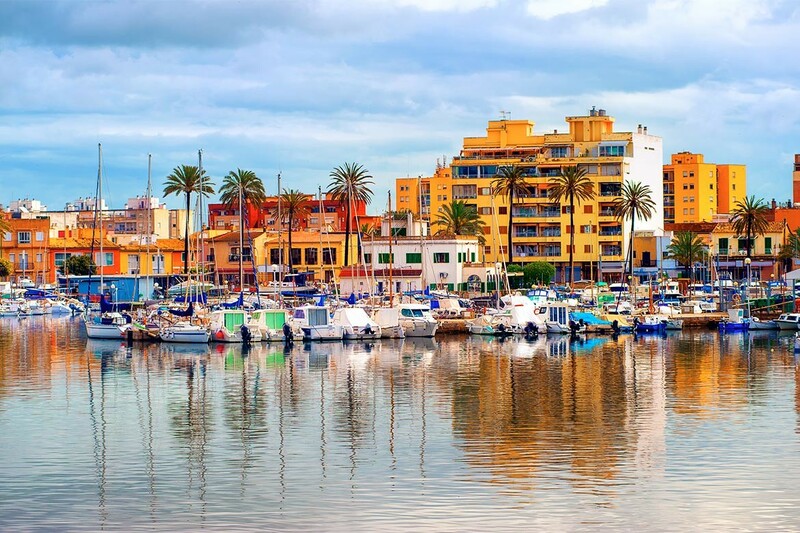 From the marina in Palma, it's a relatively brief journey to Puerto Andratx, located on the southwestern tip of Mallorca. The harbor sits at the base of steep and scenic hills, sprinkled with enchanting villas. Revel in the bars and restaurants along the harbor, or explore deeper inland to the quaint little town of Andratx. 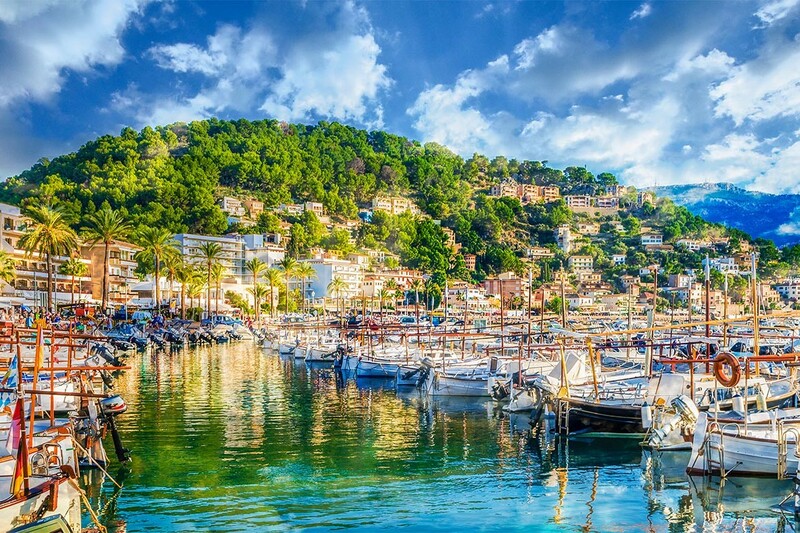 Puerto Soller sits in the arms of a gorgeous, natural horseshoe bay and is the jewel of the island's west coast. 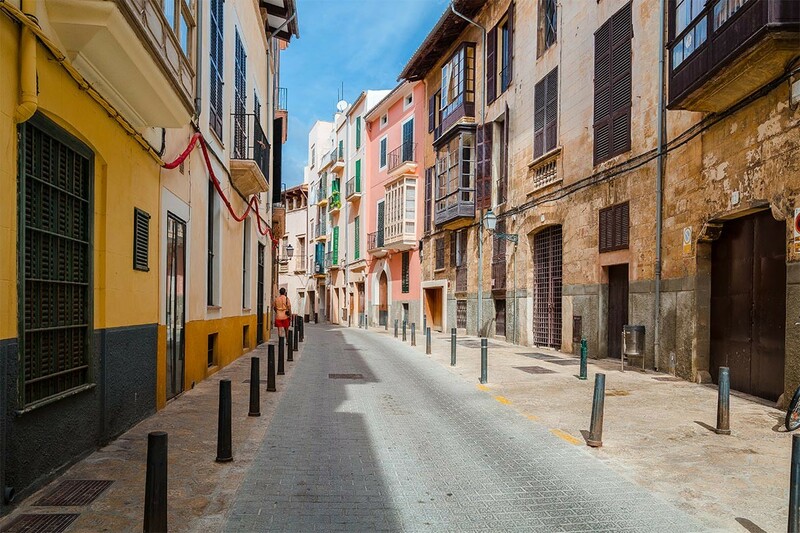 This town is more rustic and artsy than other Mallorca destinations, with delightful cobbled streets and small restaurants and bars. If you're in the mood to explore, an old-fashioned tram climbs the hills from the port to the historic town of Soller, offering amazing panoramic views of island and sea. Perched on the rugged north coast of the island, Puerto Pollensa is surrounded by dozens of picturesque, sheltered anchorages that are perfect for swimming, diving, snorkeling, and relaxing. This area is one of the most naturally beautiful on the island and filled with opportunities to enjoy fun & sun activities. 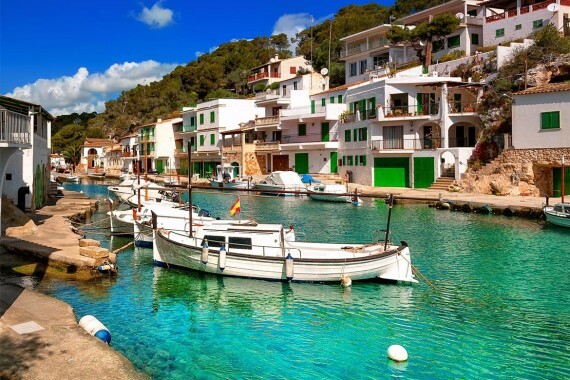 Curving around now to the northeastern tip of the island, Cala Rajada is a small, traditional fishing village that is home to gorgeous white sand beaches and amazing turquoise seas that are perfect for snorkeling and swimming. The local lighthouse is an attraction all its own and offers dramatic views in all directions. Play and relax in ultimate style! Swinging gradually to the southeast side of the island, Cala d'Or is famous for having the best weather in all of Mallorca. Warm breezes and white sand beaches beckon you to relax, and the numerous five-star resorts, restaurants, and entertainment options provide endless opportunities to sample the delights of the island. You can also explore inland, to hike among wooded hills and dramatic sea cliffs. Cabrera Island is a short sail south of Mallorca and is a protected nature reserve. The natural bay is one of the Mediterranean's most beautiful snorkeling destinations, with plentiful turtles, fish, dolphins, marine life, and birds to amaze you. The island also has several historic attractions, including a Napoleonic-era military base and 19th century lighthouse. Back to luxurious Palma de Mallorca, the crown jewel of the island and one of the world's premier luxury resort destinations. 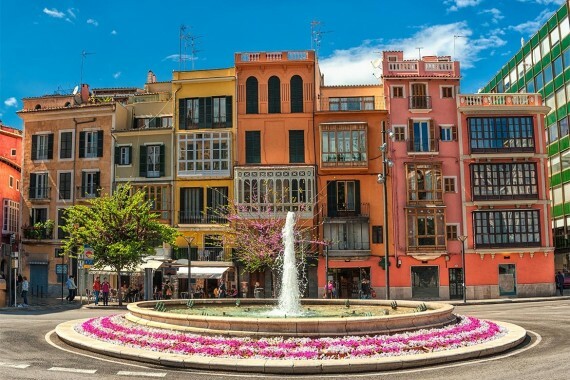 Bars, clubs, fine dining, and more – Palma has something for everyone and is a wonderful way to tie a ribbon on your glorious yacht charter Mallorca holiday! The Balearic Islands have everything you could want in a yacht charter vacation: warm and welcoming weather, amazing clear waters teeming with marine life, luxurious white sand beaches, and the endless variety of dining & entertainment options you expect from one of the world's true five-star destinations. A Mallorca yacht rental holiday is your chance to live the dream, and Navigare Yachting is here to make it happen for you! Did you know Navigare Yachting exclusively offers a payment plan that allows you to pay for your Mallorca yacht charter in up to six monthly installments? We're committed to making your Balearic Islands vacation as easy and simple to manage as possible! 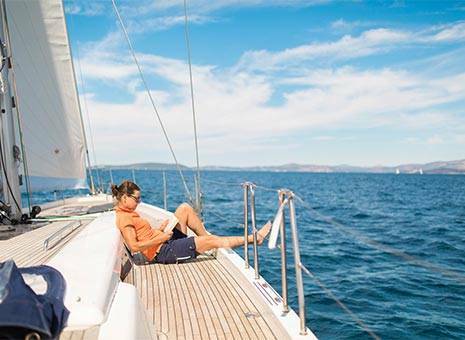 Check out our fleet page to review our selection of charter sailboats and charter bareboats, including skippered charter options. Don't wait, begin your Mallorca yacht charter adventure today! Setting out eastward from the marina at Palma, sail for Cabo Blanco, a gorgeous resort town perched in scenic hills above the sea. A brilliant white sand beach shelves gently into the water and the view is spectacular. Es Trenc is a bit further up the coast. It's a calm natural harbor with an isolated and spacious beach, not attached to any resort developments. 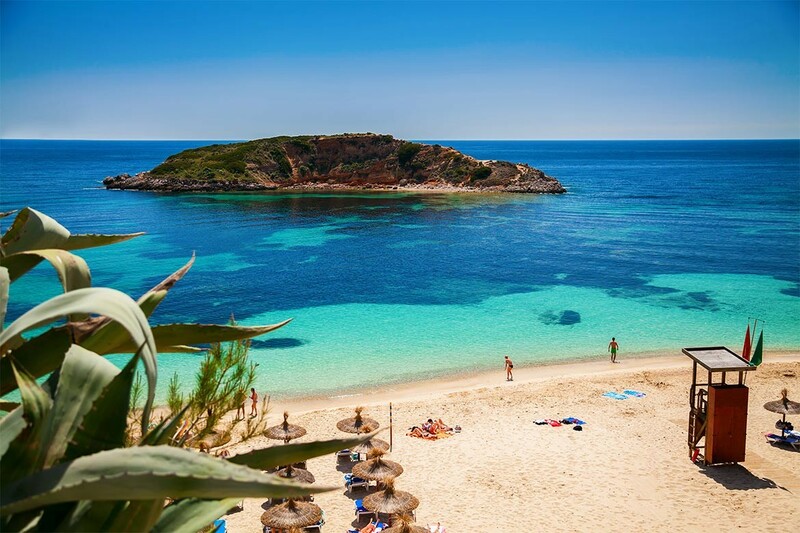 With 2km of warm golden sand and crystal clear water, Es Trenc is one of Mallorca's premier relaxation destinations. Cabo Salinas is at the center of a long and lovely stretch of sheltered coves, hidden beaches, and stunning cliffs along Mallorca's eastern coast. The vistas here are both dramatic and soothing, with tropical maritime scenery that feels pulled from a film. 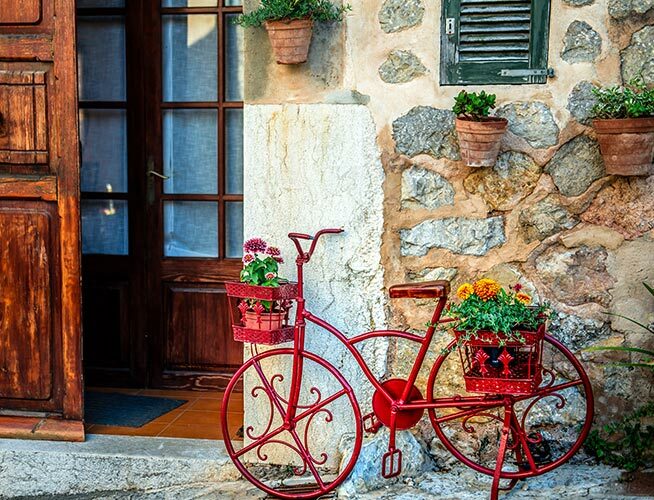 Porto Colom is a small fishing village of pastel cottages and cobbled streets. Venture inland to explore caves, hike the gently rolling hills, or visit the Santuari de Sant Salvador, an historic pilgrimage destination. 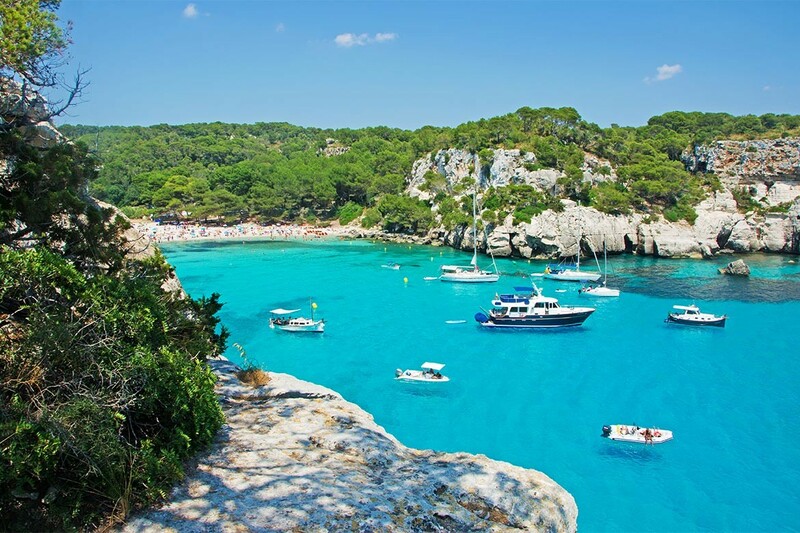 This area is called the Calas de Mallorca, “the Coast of the Coves.” The crystal clear waters are perfect for swimming and snorkeling, or just sun yourself in the unbelievably pleasant weather of Mallorca's east coast. Porto Cristo's terrace restaurants overlook the bay, with wide views of sand and sea. The famed “Dragon Caves” are a nearby attraction popular with hikers and nature explorers. Situated along the northern tip of the island, Cala Formentor is one of the region's most beautiful and stirring locations. Rugged mountains clad in pine and brush march down to the sea, where a long strip of pristine sandy beach beckons you to lounge and play in the sun. Several bars and restaurants offer cozy dining & entertainment options to while away the long summer hours. 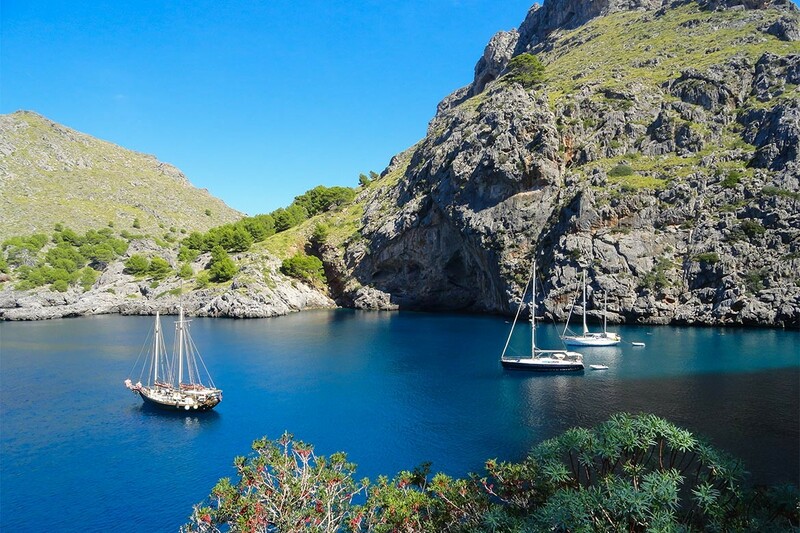 Sailing now down the northwest coast of the island, Sa Calobra is a small bay and a very scenic string of pebbly beaches, with several restaurants and bars along the way. Small tunnels under the hills link the beaches and the area is also fun to explore while hiking or biking. Adjacent sheltered coves offer secluded places to tie up, swim, and enjoy the added relaxation that privacy allows. 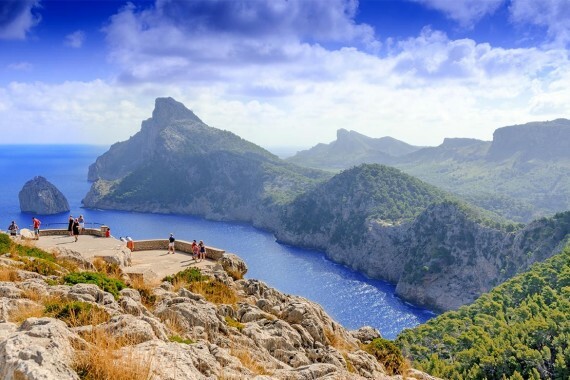 Sa Dragonera National Park is named for the abundant indigenous lizards that call the island home. Stay in the water and you'll see an amazing proliferation of marine life and intriguing underwater scenery. Go ashore and explore several kilometers of trails and pathways, including a route that takes you to an ancient watchtower that crowns the island. The plentiful wall lizards will crawl on your hands and arms with a little coaxing, but don't feed them! 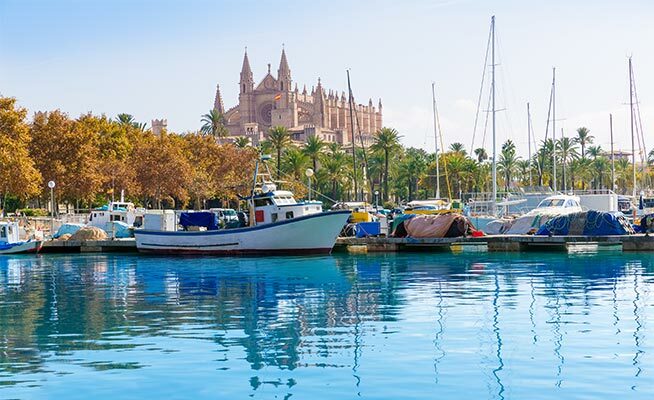 Palma de Mallorca is one of the world's most coveted luxury destinations – it's the perfect place to spend the last night of your epic Mallorca yacht charter holiday. There are dining & entertainment options around every corner, including numerous five-star establishments that cater to the luxury crowd. Treat yourself, you deserve it!